John Frederick Cartan (1958 - Present). Born April 3, 1958 at Bozeman, Montana. Grew up in Idaho Falls, Idaho. Earned a B.S. in Computer Science, a B.S. in Psychology, and a Masters in English from the University of Utah. Once travelled to Paris on a moment's notice. Spent five years alone in a cottage on the Continental Divide. Met his wife, Betsy Joy Brazy, on the internet and married May 24, 1992 at South Bend, Indiana. They have one child, Sarah Irene Cartan, born May 22, 1999. Currently working as a writer and computer user interface designer in Alameda, California. See Picture of Five Cartan Men. Frederick Owen Cartan (1928 - 1998). My father. Born October 22, 1928 at Corvallis Oregon. Grew up in southern California. Earned a B.S. in Chemistry from the University of California, Berkeley, and a Ph.D. in Physical Chemistry from Montana State University. Married July 9, 1955 at Idaho Falls, Idaho. Worked for over 35 years at the Idaho National Engineering Laboratory. A voracious reader, he also enjoyed backpacking and canoeing. Died April 6, 1998, in Helena, Montana, after a twenty-year battle with Polycythemia. See pictures and obituary. 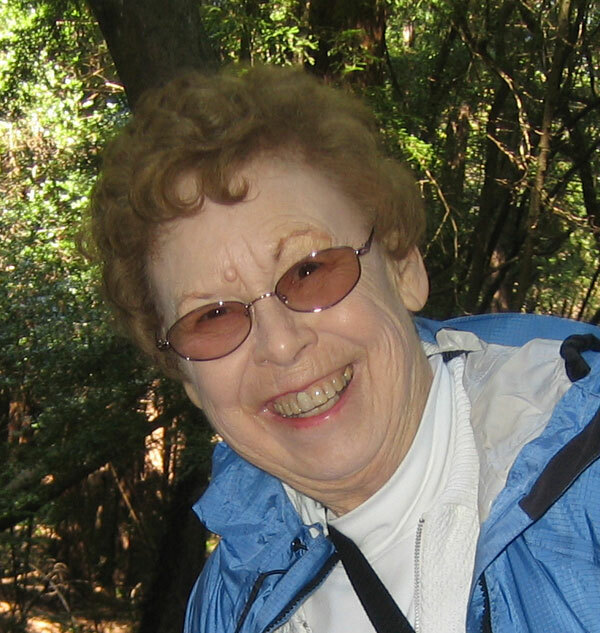 Gloria Joan Harrison (1931 - 2016). My mother. Born September 9, 1931 at Helena, Montana. Attended a one-room schoolhouse and earned a B.S. in Chemistry from Montana State University. Worked as a chemist at the Idaho National Engineering Laboratory in Idaho Falls, Idaho and later became executive director of an alcohol drug treatment program. Raised two children. Retired to a house of her own design on her parent's ranch, 30 miles north of Helena, Montana. Died April 17, 2016, at her home in Canyon Creek, Montana. See picture. Frederick Roger Cartan (1898 - 1970). My father's father. Born September 12, 1898 at Medicine Lodge, Kansas. Completed three years of Civil Engineering at Oregon State. Married June 16, 1927. Moved to southern California and did various jobs to keep his family fed. Worked for many years in the engineering group of the Los Angeles County surveyor. Transferred to the Park's Department where he had much more freedom to carry out complete projects and was then much happier. Enjoyed pipes and cigars. Was an excellent photographer and enjoyed the outdoors. Had a life-long interest in amateur radio. Retired to Paradise in northern California and spent much of his time in his ham radio shack. Died March 8, 1970 at Paradise, California. See picture. Bertha Irene Hogue (1904 - 2008). My father's mother. Born September 1, 1904 at Sharon, Kansas. Her mother died when she was fourteen, and was replaced with a more rigid stepmother and three stepsisters. Earned a B.S. in Physical Education from Oregon State. Met her husband while working as a nursemaid to his ailing mother. Raised three children during the Great Depression and War years. Was a Girl Scout Leader for 35 years. Loved to read. A master weaver and gardener. Had a reputation for never getting angry. Died July 26, 2008 of natural causes at Paradise, California. See picture. Henry Thomas Harrison (1899 - 1970). My mother's father. Born May 27, 1899 at Lawrence, Massachusetts. Came west at age twelve with his mother after her divorce. Married July 12, 1920 and honeymooned in southern California. He and his family lost everything in the Helena earthquake of 1935 and had to start over. Operated a sawmill and a ranch. Liked to hunt and fish. Died January 16, 1970 in Helena, Montana. See picture. Eva Hazel Milliron (1900 - 1986). My mother's mother. Born September 22, 1900 at Basin, Montana. Grew up as the youngest of a family of nine in the mining towns of Elkhorn, Flesher, and Boulder. Was a frequent rider in community horse races. Loved to dance and once won a dance competition. Though she had little formal education, she raised two children and saw them both through college. She and her husband homesteaded a ranch near the Continental Divide where she spent most of her adult life. She was postmistress of Wilborn, operated a general store, and chased cows till she was well into her eighties. Died September 7, 1986 from pneumonia after a broken hip (as did her mother). See picture and monologue. Frederick James Cartan (1860 - 1917). My father's father's father. Born January 7, 1860 at Brantford, Ontario, Canada. At age three his father died in a fire and the family moved to Wisconsin. His mother later sent him to his sister and her husband in Kansas in hopes of educating him to be a lawyer but at age sixteen he ran away to a cattle ranch in Montana. Eventually a friend of his father got him a railroad job in San Francisco (he was listed in the 1889 city directory as a conductor for the Market Street Railroad). In 1889 he married a waitress, supposedly because of the perky way she tied her apron. 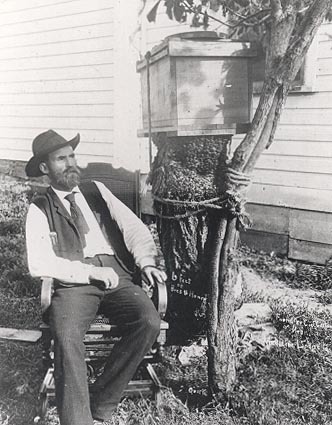 After the death of their first child, he rejoined other family members in Kansas, and later settled in Oregon, where Frederick spent his remaining years as a bee-keeper at Hood's River. Died August 15, 1917 at Corvallis, Oregon. See picture. Olga Sophia Brunhilde Lundberg (1866 - 1928). My father's father's mother. 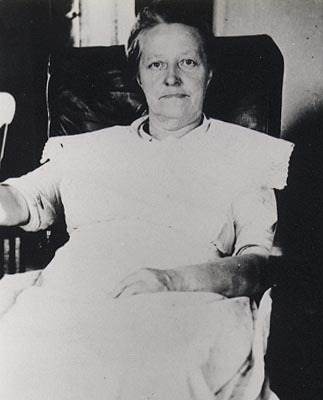 Born November 2, 1866 at Skellefteå, Sweden. The family moved to Umeå in 1878. As a child she would go to Stockholm in the summer and skate up the canals in the winter. During the winter, all the clothes would be piled up by the month, then in the spring, the girls would spend a week washing and mending. If someone died during the winter, the body was put in an igloo type house with candles. In 1883, Olga's older sister Karolina Viktoria left for America. On April 23, 1885, when Olga was 18 years old, she gave birth to an out of wedlock child named Lovisa Elisabeth. A few months later, on July 30, 1885 Olga followed her sister to America, departing from Gothenburg on August 14 bound for New York. (Her baby girl stayed with her grandparents, but she died the following year on March 5.) She later said that when she got off the boat she walked along picking flowers. She then made her way to a Swedish community in Kansas. Her parents and siblings planned to join Olga and Karolina in August 1888, but a great fire that same year devastated big parts of Umeå and at least 2300 of 3000 inhabitants became homeless. This meant a lot of work for Olga's father, a house painter, so the family delayed their departure from Sweden for four more years. During this time Olga travelled to San Francisco, where she met her future husband while working as a waitress. They were married sometime in 1889 and on September 7th of that year she gave birth to a girl, Genevieve. Genevieve died of Meningitis less than two years later on July 4, 1891. The following year, on May 24, 1892, Olga's father, mother, and four more brothers and sisters left Umeå sailing from Gothenburg on May 31. They travelled via Liverpool on the ship "Etruria" and arrived at Ellis Island, New York on June 13, 1892 where they listed their final destination as Kansas City. 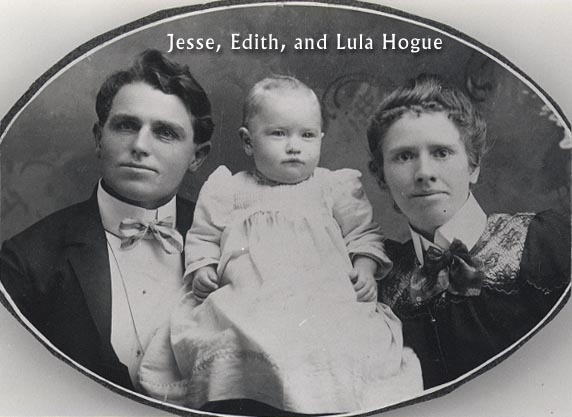 About this time Olga and Frederick joined them in Kansas, where Olga bore two more children, Hazel and Frederick Roger. 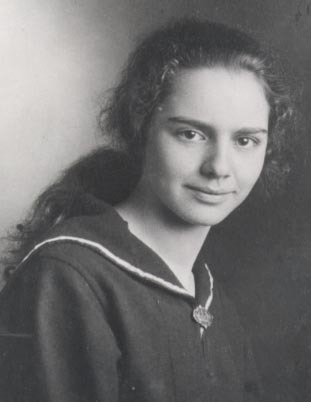 Sometime after the Frederick Roger's birth in 1898, Olga, her husband and two children moved to Corvallis, Oregon where she ran a boarding house and fed 30 students a day, including a young Linus Pauling. She was an excellent cook and kept a clean house. A stroke left her bedridden for the final seven years of her life. Died March 26, 1928 of diabetes. See picture. Albert Jesse Hogue (1872 - 1932). My father's mother's father. Born January 23, 1872 at Barnes, Kansas. His favorite childhood memory was finding himself in a cave full of snakes. He wanted to be a doctor. At sixteen, he was apprenticed to a doctor and discovered that the doctor was a crook. Afraid he was being set up as part of a scheme, he ran away from home to the Oklahoma Territory. He then caught malaria and might have died but for the help of a Native American who took him in and got him paper so that he could write home for help. Married February 14, 1899 (on Valentines Day, as did his parents, in a double wedding with his wife's brother) in Sedgwick County (Wichita), Kansas. Took over his father-in-law's farm in Sharon, Kansas. 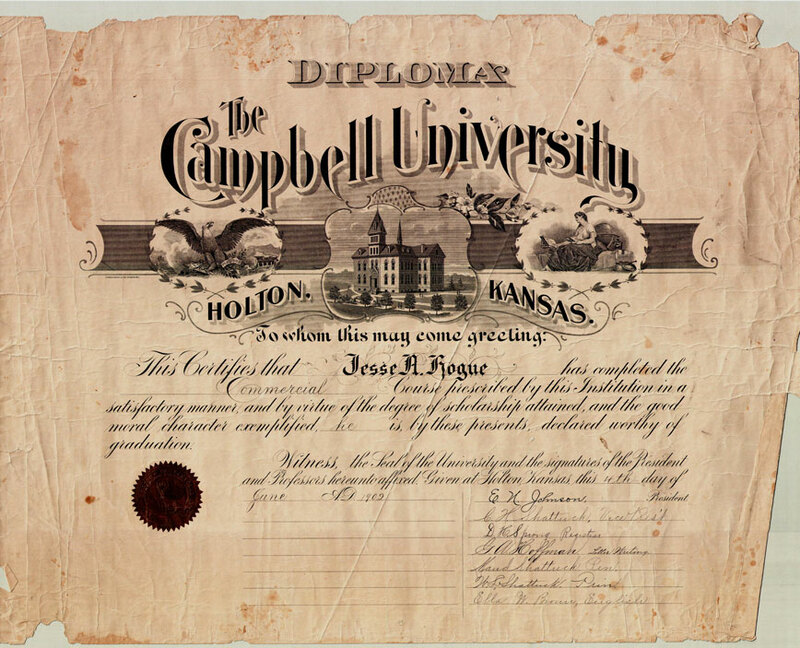 In 1902 completed a commercial course at Campbell University in Hoton, Kansas (see diploma). 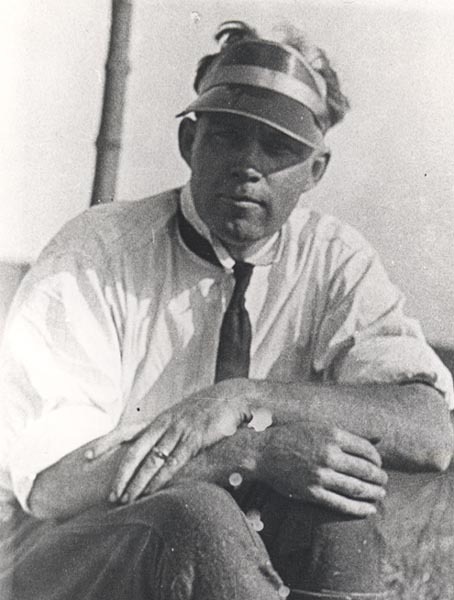 When his first wife died, he remarried a widow with three children, Flora Smith Taylor (born June 27, 1888, died August 26, 1963), on April 27, 1923. Operated a harness shop, a merchandise/shoe store and was a farmer raising wheat and dairy cows. He was described as both playful and cantankerous. When sick, he would eat Cayenne pepper. Died October 1, 1932 at Corvallis, Oregon. See picture. Louisa "Lula" Elizabeth Reynolds (1878 - 1921). My father's mother's mother. Born September 12, 1878 at Coal Creek, Anderson County, Tennessee. Moved to Kansas at age one. Married and lived in Oklahoma for a time before returning to Kansas. She bore six children and had several miscarriages. She was in delicate health for much of her life, finally succumbing to measles. She had southern manners, was a paragon of patience, and, like her daughter, never argued or became angry. Was an avid Methodist and was well known for her canned peaches. When doctors advised a change of climate, she moved the family to Camas, Washington, where her brother was living. Died March 18, 1921 at Camas. Buried at Sharon, Kansas. See picture. Henry T. Harrison (1867 - 1943). My mother's father's father. Born March 18, 1867 at Lawrence, Massachusetts. Married December 26, 1893 at Lawrence by Rev. Henry Wood and divorced around 1912. Was reportedly an excellent loom operator. 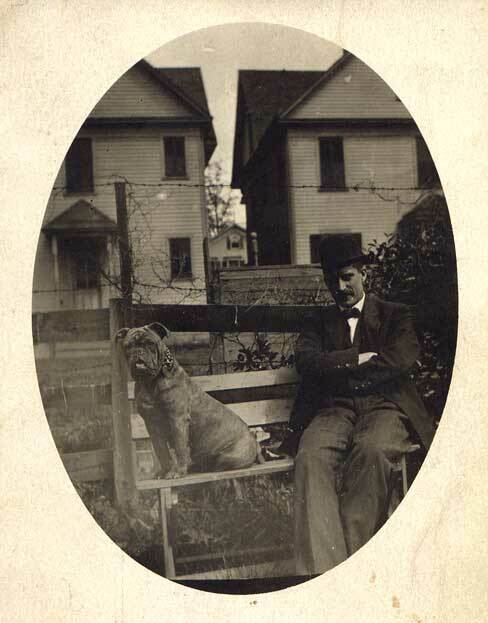 He was famous for a beer-drinking dog that would accompany him on extended bar-hopping expeditions. In 1931 he was residing at 51 Chestnut St., Providence, Rhode Island. In 1933 he moved to 226 Pine St. where he remained until his death on November 29, 1943. See picture. 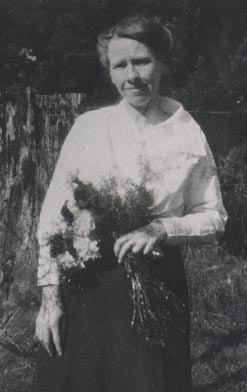 Emma A. Cosgrove (1875 - 1944). My mother's father's mother. Born March 6, 1875 at Lawrence, Massachusetts. Was a clerk when she married at the age of 18. 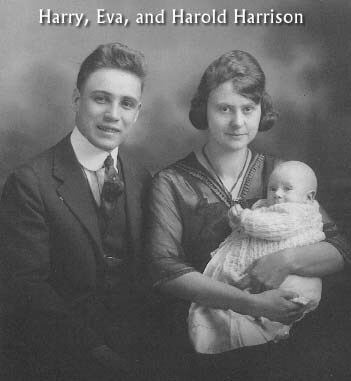 Had two children, Mae and Harry. Got a divorce when Harry was twelve. She and two children then traveled by train arriving in Helena, Montana in 1912 with very little money. She later married Nick Rorvig who owned a huge ranch near Townsend and left her with a sizable estate when he died. She was not a good money manager and soon spent the fortune. In her senior years she again married, to a man named Ashton. Died December 29, 1944. See picture. 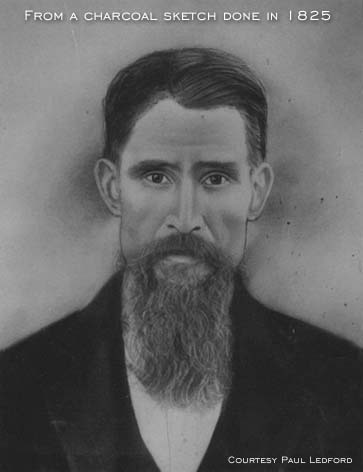 Daniel Milliron (1861 - 1928). My mother's mother's father. Born March 3, 1861 in Vernon, Ohio. 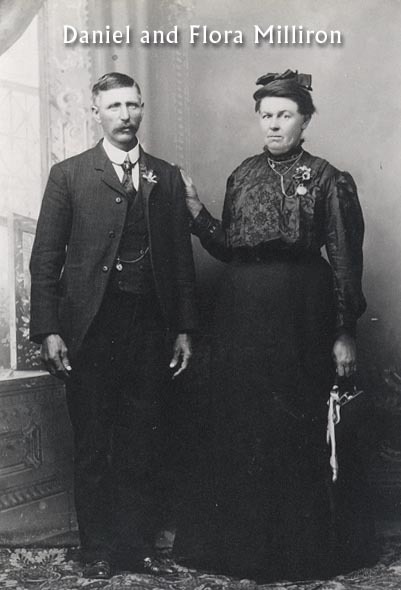 Married in the early 1880s and came west in 1890 to work the Marysville Mine in Montana. He rode a horse from Ohio and, upon arriving in Silver City his first task was to help bury the dead from an Indian massacre. Was active in the Miners Union movement and worked on various mines and ranches in western Montana. Died June 28, 1928. See picture. Flora Baker (1860 - 1935). My mother's mother's mother. Born July 22, 1860 in Sciotoville, Ohio, the first of eight children. Completed what in those days was called the 9th Forum. Loved to read. Had a special interest in women's right to vote. Bore eleven children, nine of whom survived to adulthood. She kept with her a fragment of a love letter she had received at age seventeen. Died November 24, 1935 from pneumonia after a broken hip suffered in the Helena Earthquake. See picture. Roger Peter Cartan (1822 - 1863). My father's father's father's father. Born February 1, 1822 at Claudy, County Derry, Ireland. His father was James Cartan. 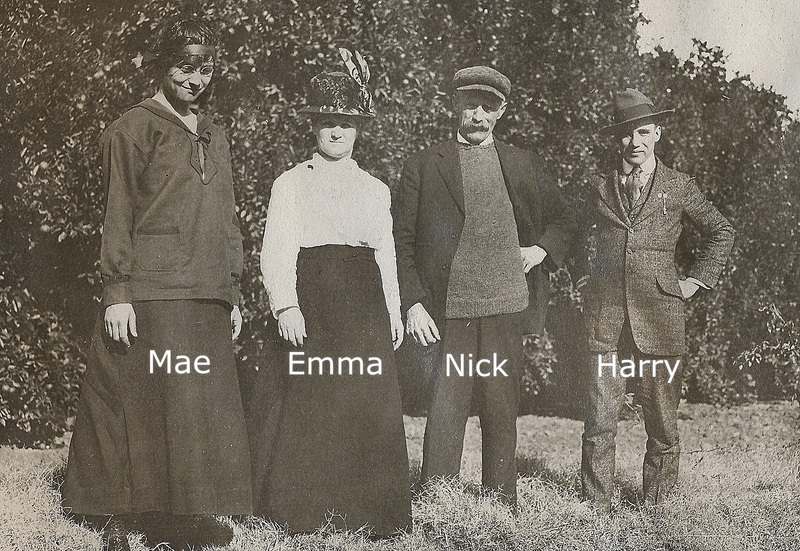 He had one brother, James, and three sisters (who never married), Annie, Catherine, and Sarah. Though his family were of relatively modest means, he had a very fine education and was a gentleman of fine literary taste. In 1841, while still in Ireland, he applied for but failed to obtain a job as schoolmaster at the Tirglasson School. Emmigrated from Ireland in the late 1840's. Upon arriving in America he became a school trustee, established a mercantile business on the edge of an Indian encampment in Brantford, Ontario and had no further communication with his family. Married Febrary 2, 1854 at Beloit, Wisconsin. He operated his business, a dry goods store, with a partner, Francis O. Dee. The Cartan and Dee store was a large building on the corner of Market and Colborne Streets in the center of Brantford. One fire which swept through the town on February 17th, 1860 did $8000 damage to the store (which was insured for only $5000). Died July 9, 1863 in another fire at his store. See love letter with picture and descendants. Phoebe Calista Dresser (1828 - 1908). My father's father's father's mother. Born August 24, 1828 at Ancaster, Ontario, Canada, the fourth of six children born to Frederick Dresser and Sarah Owen. When her husband began courting her in the early 1850's she was teaching at a girl's seminary near Brantford, Ontario. Bore five children, one of whom died in infancy. Nine years into their marriage, her husband died in a fire which destroyed his store, and a business partner cheated her of the business and most of the remaining holdings. Alone and forced to support four small children, Calista returned to her parents in Beloit, Wisconsin where she sewed and taught school. Died January 2, 1908 at Medicine Lodge, Kansas. See picture. Karl Viktor Lundberg (1837 - ?). My father's father's mother's father. Born July 11, 1837 in Örebro, Sweden, the son of a carpenter. In August 1859 he became an apprentice to a painter and he lived in the home of master painter Anders Lindblom in Härnösand for four years. In 1863 he became painter himself and got married the same year. Karl and his wife stayed in Härnösand for two years until they moved in September 1865 to Skellefteå where they remained until 1878. In Skellefteå he continued supporting his family as painter. In 1878 the family moved to Umeå (1878-1892). In August 1888 Karl planned to join two of his daughters in America, but a great fire devastated big parts of Umeå and at least 2300 of 3000 inhabitants became homeless. This meant a lot of work as a painter so they stayed until May 1892. On May 24, 1892 they left Umeå, sailing from Gothenburg on May 31 via Liverpool on the ship Etruria and arrived at Ellis Island on June 13, 1892. They then joined their daughters in Kansas. In 1910 they lived in Kansas City, Missouri where Karl was still supporting his family as painter. See picture. Lisa Märta Bostedt (1841 - ?). My father's father's mother's mother. Born December 16, 1841 in Boteå Parish, Västernorrland County, Sweden. In 1859 she became a maid in the household of master painter Anders Lindblom in Härnösand, which is where she met her future husband. Together they raised ten children. See picture. Clinton Hogue (1839 - 1922). My father's mother's father's father. Born February 24, 1839 at Cuyahoga Falls, Ohio. He weighed only three pounds at birth. 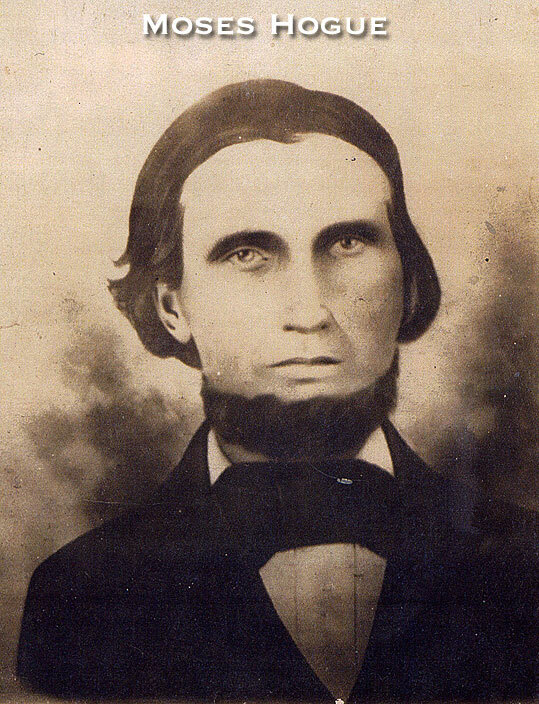 In 1857 he moved to Waterloo, Indiana to learn the harness maker's trade. Served extensively in the Civil War. He was mustered into the US Army on July 29, 1861 as a private in Company G of the 19th Indiana Regiment of the Infantry, known afterwards as the Iron Brigade. He participated in 23 major engagements and was twice wounded. He re-enlisted January 1, 1864 at Culpepper, Virginia and was mustered out, with the rank of 1st Lieutenant, at Louisville, Kentucky on July 12, 1865. 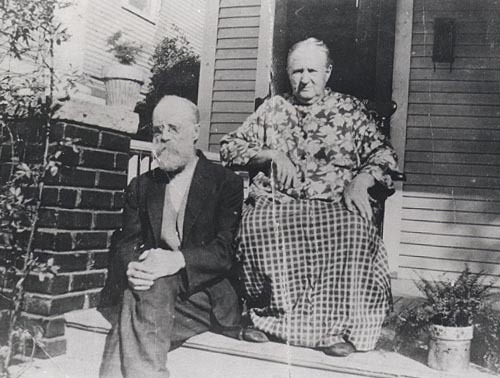 He married February 14, 1866 and moved to Savannah, Missouri where he farmed and raised livestock. In 1870 he homesteaded 1.75 miles east of Barnes, Kansas where remained for the rest of his life. In 1884 went into the mercantile business with a Mr. Hazen, and later with a Mr. Ballard. Retired 1904. Was president of Barnes State Bank. Died June 12, 1922, at Barnes, Kansas and was buried in the Maplewood cemetery. See picture. 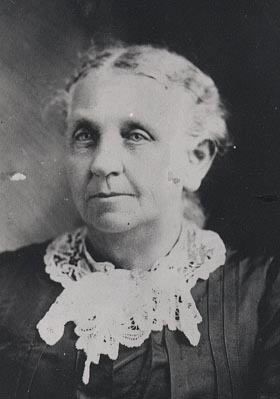 Lucy Catherine Strong (1845 - 1916). My father's mother's father's mother. Born June 20, 1845 at South Hadley, Massachusetts. She was educated in the public schools of Summit County, Ohio. Taught in country schools for a salary of $2.50 a week and "boarded around". She was a member of the English Lutheran Chrurch. Raised twelve children. Died March 18, 1916 at Barnes, Kansas. Buried in Maplewood Cemetery. See picture. John Reynolds (1850 - 1918). My father's mother's mother's father. 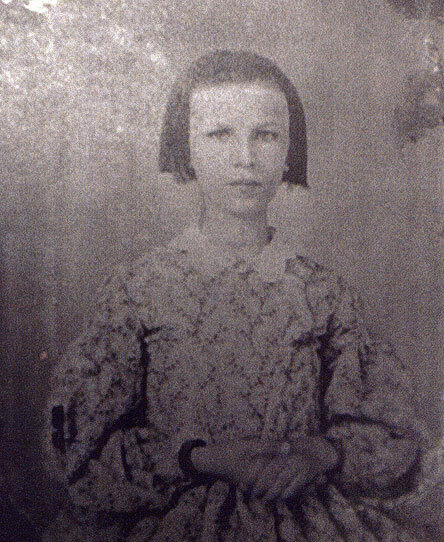 Born May 17, 1850 at Coal Creek, Tennessee, the fifth of ten children. Became a Baptist at age twenty. Married March 11, 1875 at Coal Creek (now Lake City). 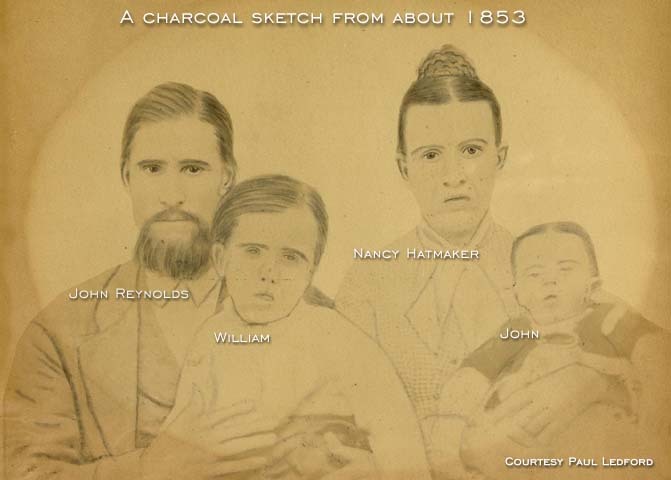 Moved around 1879 with his wife Mattie, two children (Louisa and John Quincy), and at least one of Mattie's brothers to the area of Atchison, Kansas where they worked various jobs on the railroad and as cattle drivers until the Cherokee Strip opened up. On September 16, 1893 John Reynolds and the Graham families dashed in and staked their claim for what became their part of Oklahoma. An estimated 150,000 people lined up along the boundaries, guarded by the army, and waited until high noon when the shot was fired to begin the race that was later known as the Oklahoma Stampede. Within two hours the 6 million acres of land known as the Cherokee Strip had been claimed. The Reynolds and Grahams claims were of 160 acres each located in what became Grant County, Oklahoma situated just north west of Deer Creek. They built homes on this property and had nice farms. Around 1901 they rented the homestead in Oklahoma, moved to Sharon, Kansas and lived just north of town. They continued farming and, for a time, his son John Quincy ran a store. In 1906, both his wife and mother died and he returned to Tennessee for the winter to help settle her estate. In 1907 he returned to Kansas, bought a house in Wichita, and married a lady by the name of Bettie who had a daughter named Clara Perkins. They purchased other properties in town and lived with his other son Charles, who eventually married and had his own residence in Witchita. Died January 4, 1918. His body was shipped back to Sharon for burial beside his first wife. See picture. 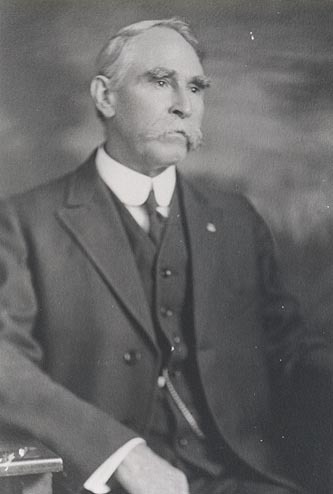 Mattie M. Grayham (1852 - 1906). My father's mother's mother's mother. 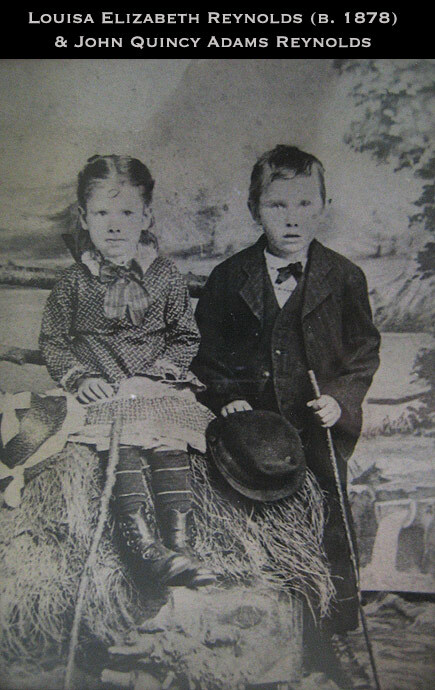 Born February 2, 1852 near Boston, Kentucky, the sixth of nine children. Raised three children. Died May 25, 1906 at Sharon, Kansas. Thomas Harrison (1830 - ?). My mother's father's father's father. Born in England. His first two children were born in Rhode Island (1855 and 1857); the family apparently moved to Massachusetts before 1859 when his third child was born. By age 40, he was working in a cotton mill at Lawrence, Massachusetts. He and Harriet (probably his second wife) had six children: Mary A., David, Hattie, Charles, Henry (my great-grandfather), and Lizzy. At ages 15 and 13, his two oldest children were already working as a silk weaver and a winder; Henry eventually became a loom operator. Harriet [maiden name unknown] (1841 - ?). My mother's father's father's mother. Born in England. Thomas Cosgrove (? - ?). My mother's father's mother's father. Dalia Holtham (? - ?). My mother's father's mother's mother. Died young, sometime shortly after 1875, probably at Lawrence, Massachusetts. Had a sister or sister-in-law Kate who had daughters named Lillian and Bertha. Abraham Millirons (? - ?). My mother's mother's father's father. Probably born in Virginia. Married June 27, 1855 at Scioto County, Ohio. Rebecca Strait (? - ?). My mother's mother's father's mother. Probably born in New Jersey, of German (Pennsylvania Dutch) ancestry. George Washington Baker (1832 - 1916). My mother's mother's mother's father. Born March 14, 1832 in Scioto County, Ohio. Married December 25, 1856 in Scioto County, Ohio. Worked as a common laborer and as a collier (coal miner). In 1870 had $500 in real estate, $200 in personal estate. Died February 22, 1916 (About 12:00pm) of infirmities of age at Bloom township, Scioto County, Ohio. Buried February 24, 1816 at Vernon cemetery, Vernon Township, Scioto County. Nancy Martin (1832 - 1910). My mother's mother's mother's mother. Born October 9, 1832 in Jackson County, Ohio. Had eight children: Flora (1860), Belle (1866), Horatio Seymor(1868), Martha Jamy (1871), James (1872), John (1874), Raitt (about 1876), and Jane (1880). Died April 13, 1910. James Cartan (? - ?). My father's father's father's father's father. Born in Ireland, probably at or near Claudy. Frederick W. Dresser (1799 - 1889). My father's father's father's mother's father. Born January 24, 1799 in Tolland, Connecticut, the first of six children. Married October 7, 1821 at Canandeigua, New York. Immediately moved to Ancaster, Canada West (now the Province of Ontario) where Frederick was a school teacher and farmer. After his wife's death, married again in 1834 and again in 1878. Died February 19, 1889 at Rockton, Illinois. See picture. Sarah Owen (1798 - 1833). My father's father's father's mother's mother. Born September 18, 1798 at Canandeigua, New York. Raised six children, all born in Ancaster, Ontario. Died December 8, 1833 at Ancaster. Lars Eric Lundberg (? - ?). My father's father's mother's father's father. A carpenter born in Sweden, possibly at or near Örebro. Lovisa Israelsdotter (? - ?). My father's father's mother's father's mother. Moses Hogue (1815 - 1884). My father's mother's father's father's father. Born March 15, 1815 at Stow, Ohio in the township of North Hampton, Summit (Portage) County. His father was one of two brothers who emigrated from Northern Ireland in 1813; they called themselves Scotch-Irish because the English had moved them from Scotland to Ireland. His mother was also from Ireland. Moses was reportedly the youngest of eighteen children. Married February 1, 1838 in Cuyahoga Falls, Ohio. He worked as a farmer and a carpenter. Died August 18, 1884 at Waterville, Kansas after a sever attack of rheumatism. Burial at Riverside Cemetery. See picture. Margaret Gilkerson (1809 - 1878). My father's mother's father's father's mother. Born April 20, 1809 of Scotch parentage at Barnet, Vermont, the first of eight children. Apparently named after her father's first wife, Margaret Ferguson, who died shortly after she was married. Came from a large family of old school Presbyterians known as Covenanters, and was a woman of sturdiest integrity. Travelled west to Ohio in 1834. Letters from her father, brothers Walker and John, and sister Esther suggest that she may have left without telling her family goodbye. Joined the Methodist Episcopal Church in 1836. Raised six children. Died July 5, 1878 at Cuyahoga Falls, Ohio. See picture. 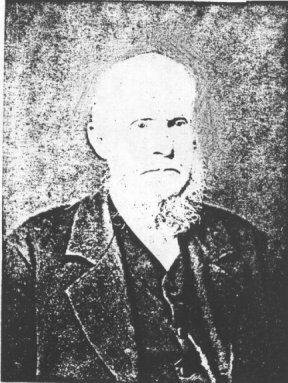 Eleazor Herrick Strong (1821 - 1904). My father's mother's father's mother's father. Born June 26, 1821 in either Springfield or South Hadley Falls, Massachusetts. Married April 5, 1843 at Springfield or South Hadley Falls. Was a paper manufacturer in South Hadley Falls and operated the same kind of business in Cuyahoga Falls, Ohio. Died October, 1904. See picture. Elizabeth Brained Cowles (1818 - 1899). My father's mother's father's mother's mother. Born March 7, 1818 at East Hartford, Connecticut. Died Dec 23, 1899 at Cuyahoga Falls, Ohio. See picture. John Reynolds (1808 - 1891). My father's mother's mother's father's father. Born November 12, 1808. According to family legend "Old John Reynolds was the best marksman in New River. He was the last person to kill a bear on New River." He ran a store and had a turkey shoot. Did extensive logging in the mountain area where he lived and owned some 15,000 acres of land. In his early years rode logs down the rivers to the Mississippi sometimes being gone 6 months to a year at a time. Married November 15, 1840 in Anderson County, Tennessee. Died January 26, 1891 in Anderson County. Buried in the Bunch Cemetery in the New River area of Anderson County. See Charcoal Sketch. 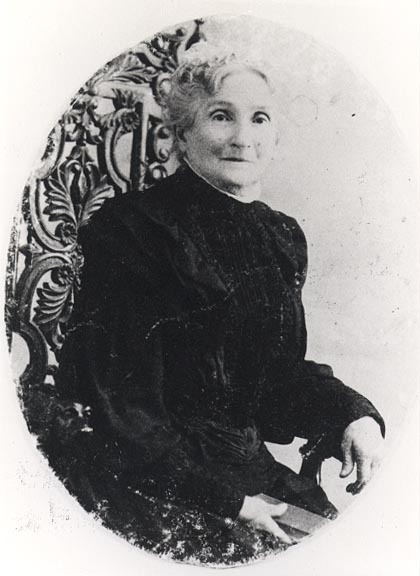 Nancy Hatmaker (1821 - 1906). My father's mother's mother's father's mother. Born November, 1821. Had ten children, all of whom except John remained in Tennesee. Died 1906. Buried in the Bunch Cemetery in the New River area of Anderson County. See Charcoal Sketch. Joseph Graham (? - ?). My father's mother's mother's mother's father. Died in a fire at a mill. Mattie [family name unknown] (? - ?). My father's mother's mother's mother's mother. Raised nine children. Died of breast cancer. See picture. John S. Baker (1799 - after 1860). My mother's mother's mother's father's father. Born in Pennsylvania. Recorded in the census of 1850, Harrison Township, Scioto County, Ohio and in 1860. Mary [family name unknown] (1800 - after 1860). My mother's mother's mother's father's mother. Born in Pennsylvania. Recorded in the census of 1850, Harrison Township, Scioto County, Ohio and in 1860. John Martin (about 1797 - 1849). My mother's mother's mother's mother's father. Possibly born in Mason County, Kentucky or West Virginia. Reportedly came to Ohio in 1817 and worked as a farmer. Married between 1820 and 1821 at Jackson, Ohio. Died of a fever in August of 1849 in Jackson County, Ohio. Died intestate and property was sold to satisfy judgments. 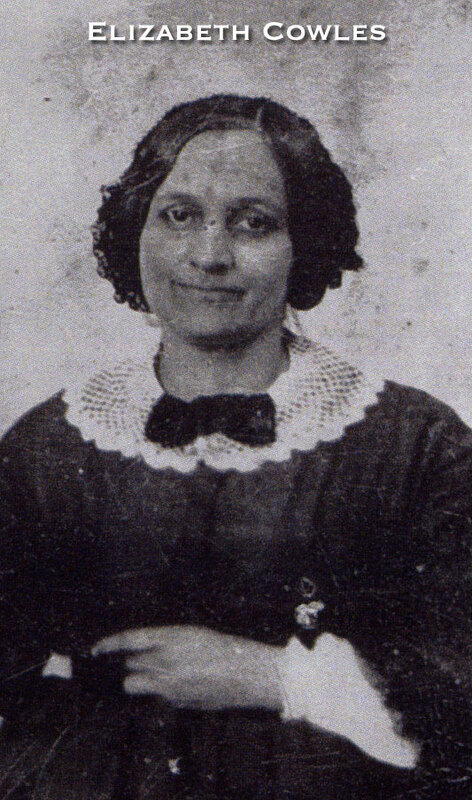 Martha J. Baty or Beatty (1797 - 1864). My mother's mother's mother's mother's mother. Born July 6, 1797 in Greenbrier County, Virginia. Mother's maiden name may have been Burns. Reportedly came to Ohio in 1817. Raised eleven children. Died September 5, 1864 in Jackson County, Ohio. Buried in Jackson Furnace Cemetery (inscription faded). John Dresser (1771 - 1843). Father of Frederick W. Dresser (34). Born August 19, 1771 in Pomfret, Connecticut, the second of three sons. Married March 29, 1798 at Brooklyn, Connecticut. Moved to South Conventry, Connecticut, where all their children were born. Married again after the death of his first wife. Died March 7, 1843 at Coventry. Delight Gilbert (1773 - 1816). Mother of Frederick Dresser (34). Born October 23, 1773 at Tolland, Connecticut. Raised six children. Died February 7, 1816 at Coventry. John Gilkerson (1770 - ?). Father of Margaret Gilkerson (41). Born May 8, 1770 in Kilwinan (Kilwinning), Scotland, the eldest of six children. His father, John Gilkerson (born near Kilwinan, baptized February 9, 1742 and married July 7, 1769 in Lesmahagow, Scotland, died March 5, 1824 in Barnet, Vermont), mother Jennet Missus Gilkerson (born 1741 in Kilwinan, died June 27, 1820 in Barnet), and three younger brothers arrived in Newburyport, Massachusetts, on July 22, 1784, and moved to Boxcawen, New Hampshire. In the spring of 1786 they settled in Barnet, Vermont. They occupied the land of John Galbraith, who settled in Barnet in 1774. Married Margaret Ferguson March 29, 1804 in Barnet. She died November 30, 1805. Married Betsey Minor September 3, 1807 in Barnet. Died sometime after 1838 at Wells River, Orange County, Vermont. Elizabeth (Betsey) Minor (1784 - ?). Mother of Margaret Gilkerson (41). Born October 3, 1784 in Peacham, Vermont. Moved with husband to Barnet, Vermont. Bore eight children: Margaret, John, Esther Walker, James Minor, William, Walker Minor, Thomas, and Jinnet. Died sometime after 1841. Ely Strong (1795 - 1876). Father of Eleazor Herrick Strong (42). Born March 15, 1795 at Granville, Massachusetts. He was a cabinet maker and farmer. Married Betsey Baldwin Feb 11, 1818 at Granville, Massachusetts and had nine children with her. A few months after Betsey died, he married Betsey's widowed sister, Sallie Frary (born June 16, 1796, married December 26, 1833, died February 1, 1849). At age 54, he married his third wife, Caroline O. Shelden (born December 11, 1813, married September 3, 1849, died October 30, 1903), who gave him three more children. Died December 10, 1876 at Granville. Betsey Baldwin (1798 - 1833). Mother of Eleazor Herrick Strong (42). Born April 13, 1798 at Sandisfield, Berkshire, Massachusetts, daughter of Benjamin Baldwin (born February 19, 1758, married August 19, 1786, died July 24, 1810) and Eunice Herrick (born November 14, 1768, died August 5, 1851). Bore nine children. Died September 23, 1833 in Otis, Massachusetts. Asa F. Cowles (1785 - ?). 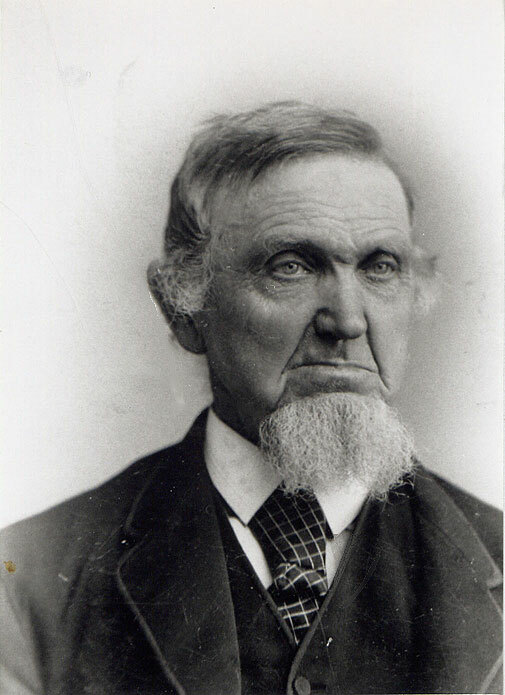 Father of Elizabeth B. Cowles (43). Born September 25, 1785 in East Hartford, Connecticut. Huldah Bidwell (1789 - ?). 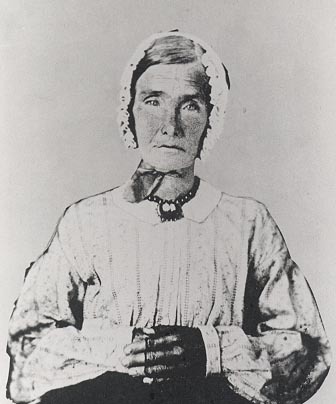 Mother of Elizabeth B. Cowles (43). Born March, 1789 in East Hartford, Connecticut. William Martin (about 1760 - 1820). Father of John Martin (62). Born about 1760, possibly in Maryland or Virginia. Married about 1779. Reportedly moved to Jackson County, Ohio about 1795. In 1811 was listed as a member of the Lutheran church. Divorced April 22, 1816 after his wife had been absent for more than seven years. Died March 13, 1820 in Jackson Counry, Ohio. Elizabeth Everly (about 1761 - after 1817). Mother of John Martin (62). Born about 1761 in Monogalia County, West Virginia or Cumberland, Pennsylvania (now Maryland). Bore eleven children. Died sometime after 1817. Father was Gaspar or Caspar Everly, born 1740 in Hess, Germany, served the Virginia Line in the Revolutionary War, died 1800 in Morgantown (Cass Township), West Virginia. Note: a researcher, Wes Hart, disagrees that my William Martin was married to Elizabeth Everly and with some of my dates, which are based on a GED file downloaded from a Martin family website. I welcome any additional facts that can help resolve this dispute. I can trace the Dressers back another fourteen generations. Thanks to Jeannette Manning Ellis and Jim Dresser for their help. Ada Dreyster (1275 - ?). Born in Middleton, Yorkshire. Full name: Ada Dreyster of Horton, Middleton in Teesdale. I can trace the Strongs back another ten generations and, through them, to the royal Spofford line, which goes back a total of 34 generations to 965 A.D. Special thanks to Elizabeth Siler for providing this information. Robert Strong (1490 - ?). Born in Berminster, Dorsetshire, England. Thanks also to Cheryl and Paul Ledford, Willard McCoy, Ramona J. Keefover Stettnisch, the Marvin Martin Family Site, Joan Cartan Hansen, Irene Hogue Cartan, and Gloria Harrison Cartan for their help in gathering this material.